Bubble Jelly Babies Framed 3D Liquid Art. Liquid art may differ in colour from that shown in the image due to each piece being uniquely handmade by the artist. 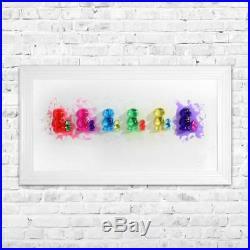 "Jelly Babies by Jake Johnson" This fun Artwork measuring 115 x 64 cm will look sweet on any wall. This is such a fun piece and looks Fab. All signed by the Artist and handmade in the UK. 1Wall have a solution for you! 1Wall are creators of fashionable wallpaper murals transforming feature walls in homes around the world! 1Wall is one of the fastest growing wall mural brands in the world with some of the biggest licenses such as our fantastic Disney, Volkswagen, DC Comics, Marvel Comics, Life Magazine and Ministry of Defence Wall Murals. With stockists in over 30 countries over the world, 1Wall are one of the world's most inspiring wall mural brands. 1Wall are the creators of the world exclusive? Launched in January 2015 the 1Wall Creative Collage is a revolutionary way to decorate! The 64 pieces of individually designed wallpaper panels can be used on the walls, ceilings or wherever your imagination takes you! The product is easy to hang, there is no experience necessary, no mess, no pattern match and creates amazing, one of a kind feature walls! 1Wall promise to ensure all of our customers and stockists are happy with our wall decoration products and customer service. We are extremely proud of every product that we create and therefore will do everything within our means to ensure our wall decoration product exceed the expectation of every customer. Next Day if ordered by 2pm. If you have any concerns or questions please call our friendly office team on 01253 599431. Our customer service team has listened to feedback received from our valued customers and put together a list of easy to understand frequently asked questions about our wall murals and framed art. How do you apply the wallpaper mural? Hanging instructions/ videos are available on youtube and our website. How can I submit a return? In the unfortunate event you wish to return your order please. Please ensure the product is in a resalable condition and the return reference provided is visible for warehouse acceptance. Please do not write directly on postal tubes. Please let us know the reason for return. Should a replacement or alternative item be requested these will be dispatched on a next day service (postal charge will apply). Can 1Wall print custom wall murals? We don't currently offer a custom print solution as all our wall murals are printed in volume to make them affordable for you. If your wall is too small for our wall murals then you can trim the mural down to fit your wall. Or if our mural is smaller than your wall you can centre the mural on your wall as a feature. What is the mural made from? 1Wall manufacture their murals from 120gsm Blue Back Paper. Why wont my mural line up? Have you overlapped the panels? All panels must be overlapped to match the image/pattern. 1Wall prints a (mm) repeat around the edge of the panel which allows for any walls not being level. (Do NOT overlap and cut splice, simply overlap the panels and leave to dry). Have you left the mural after applying paste? After pasting the back of the mural, apply this panel to the wall without delay. Allowing the paste to absorb into the paper can result in stretching on application. Please check you have the panels in the correct order and orientation before applying to the wall. The letters are printed on the front of the image in the corners, please note above the placement of the letters. I have received a damaged item from the courier, what should I do? Provide a brief description of the damage as well as photos of the packaging and product. A customer service member will be in touch within 48 hours with a resolution. Im afraid the murals are not designed to pattern match. As the murals are printed in full we are not able to separate the stock. The item "Bubble Jelly Babies Framed 3D Liquid Art" is in sale since Thursday, July 12, 2018. This item is in the category "Art\Mixed Media Art & Collage Art". The seller is "1wall_murals" and is located in Blackpool. This item can be shipped to United Kingdom.